This past Tuesday 36-year-old Jussie Smollett, who stars in Fox’s hit-show Empire, was assaulted by two men while leaving a Chicago restaurant in what police are saying may be a ‘possible hate crime’. According to The Hollywood Reporter, the two assailants yelled out racial and homophobic slurs at Smollett then proceeded to beat him, pour an unknown chemical substance on him and wrap a rope around his neck before fleeing the scene. In what can only be described as equally disgusting as the attack itself, TMZ reports the two men yelled: “This is MAGA country.” They wanted to it to be known what they stood for. They wanted people to know who was behind the attack. 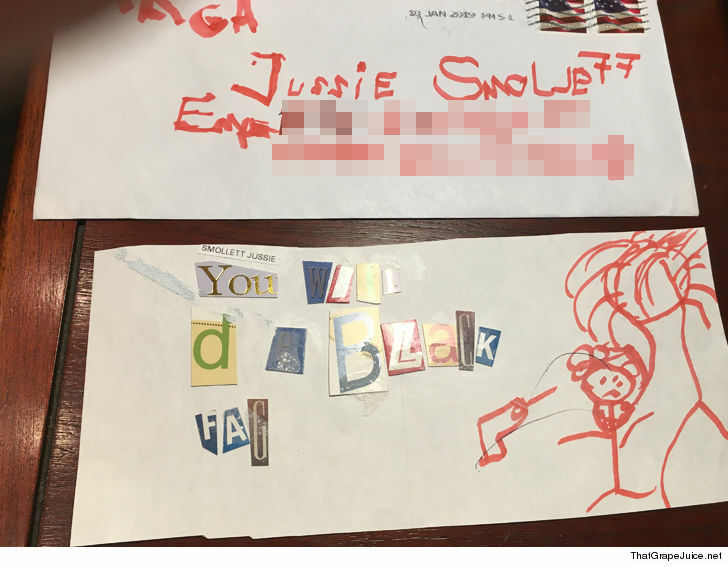 Additionally, after the story broke, sources at ThatGrapeJuice.net reported that the Empire actor had previously received a threatening letter in the mail with “You will die black fag,” written in disturbing ransom-style cutout letters. As you can see, it appears to say ‘MAGA’ in the upper left corner. Since Tuesday morning Chicago Police, as well as the FBI, have been searching every nook and cranny of the neighborhood where the reported attack occurred. Yet still, have found no still images or video from security cameras of the incident even though ‘combing through hundreds of hours of videos’. "Empire" actor Jussie Smollett was attacked in what Chicago police are calling a possible hate crime. One of his alleged attackers also put a rope around his neck, police say. Whether you’re white, Black, Muslim or straight, the attacks on Jussie should not only enrage you but open a new threshold of concern. If arguably the most famous black gay man in Hollywood is subject to hate and bigotry, what does it say for everyone else? Last week, actress and liberal activist Alyssa Milano compared President Trump’s “Make America Great Again” to white hoods worn by members of the Ku Klux Klan and got torn apart. Today, unfortunately so, it seems like she was right. We’ve seen it in synagogues, in churches and nightclubs. We saw it in Charlottesville and now we’re seeing it again. New hate crime data from the FBI says there’s been a 17 percent spike in the number of hate crimes reported nationwide, rising from 6,121 in 2016 to 7,175 in 2017. And they only make up a few. Jussie is my friend – a very talented & beautiful human being. It is so hurtful that homophobic haters would dare hurt someone so loving and giving. I'm dedicated to finding the culprits and bringing them to justice. Jussie did not deserve to be harmed by anyone! Even if right-winged supporters don’t fully align with Trump surely by now they can at least acknowledge what its come to symbolize. Furthermore, this should serve as a cautionary tale for any and everyone that doesn’t fit the MAGA mold. This is not exclusively an LGBTQ issue or exclusively a race issue. This is a humanitarian issue and until we all take it up as one, worse will only happen. Previous ArticleYoko Ono says you don't need art school to be an artist: Is she right?